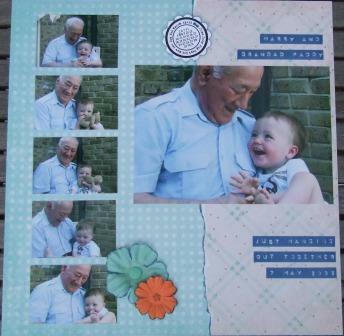 This challenge was set by Helen and used the gorgeous Dream Street Papers. I’ve been meaning to scrap these photos for a page in DS’s album for ages – perfect timing. BTW – my boy cried all the while he was in the bath, had his bedtime milk in his cot, lights out at 6.45pm and was fast asleep by 6.50pm. I checked on him at 7.15pm and found him upside down but looking like a sleeping angel!